Exclusive analysis reveals why major US brands are feeling the pressure of increased competition in the global marketplace – and how they can fight back. Hard Rock International is one of the world’s best-known leisure industry brands. World Trademark Review spoke to Rebecca Roby, its vice president of business affairs, about promoting seamless collaboration between legal and non-legal departments and the evolving challenges of managing Hard Rock’s IP rights around the globe. A data-driven examination of the banking sector reveals that Chinese bank brands are overtaking their US rivals, while customer focus, big data and multichannel delivery remain key trends. Effective IP protection at the Chinese border is one of the most important aspects of any multinational enforcement strategy. We take a deep dive into how to shore up your defensive strategy for goods leaving the so-called ‘factory of the world’. Following the results of the latest IP Office Innovation Ranking, technology company LawPanel explains why implementing open application programming interfaces could transform the trademark industry. Following in the footsteps of tobacco regulation, momentum is building in support of plain packaging for alcoholic and high-fat, salt and sugar products. These industries should act early to head off the threat of increasing legislation. The Intellectual Property Office of New Zealand is a quiet pioneer when it comes to handling trademark data and now it wants the rest of the world to follow suit. In this article, it explains how it can be done. Analysing more than 30 trademark portfolios of mid-size to large multinationals carrying out business in the European Union reveals a surprising number of illogical filings, errors and gaps. The resulting checklist will support effective portfolio review. Over the past two decades, Mexico’s enforcement framework has improved immeasurably, although challenges remain. 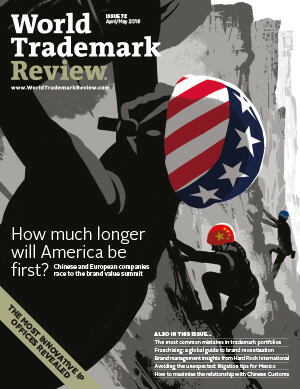 Trademark owners should consider a number of strategies in order to avoid any unpleasant surprises. Registrations for sound trademarks are becoming more prevalent at major IP registries around the world. We look at some of the opportunities for sound marks, as well as common challenges and how to overcome them. In a new multi-part series, World Trademark Review identifies the IP offices leading the way in offering innovative non-core tools and services – and the registries trailing behind. The recent Marketquest decision offers important insight into reverse confusion claims, providing a road map for using a senior user’s mark comprising descriptive terms to market a junior user’s product. Domain name dispute practice in Russia is still underdeveloped, with a lack of legal provisions regulating rights in this area. However, a recent case provides important insight into practices across Russia and the Commonwealth of Independent States. A key precedent set by Uruguay’s National Directorate of Industrial Property in a case involving adidas’s world-famous three-stripe mark affirms the importance of market surveys in cases of alleged lack of distinctiveness. IP Australia has proposed significant changes to the national trademarks regime following a report from the Productivity Commission. Having a thorough knowledge of the trademark filing system is key to obtaining IP protection, but knowing what to register is only the first step to ensure that the process runs smoothly. Prosecution strategies are dictated by the circumstances of the rights holder’s business. Nevertheless, a smart choice of trademark and thorough registration are key to protecting IP rights. To play or not to play (the waiting game) in Canada? With the new Canadian trademark regime on the horizon, rights holders should consider whether to wait or to implement a filing strategy before the present system becomes a thing of the past. Pursuant to the new Industrial Property Law, similar or identical trademarks will no longer be considered absolute grounds for refusal if applicants submit a letter of consent for use from the prior owner. Rights holders seeking trademark protection, whether on a national or international basis, should consult local counsel in order to formulate a filing strategy that holds up to Mexican customs and practice. India: The Trademarks Registry has implemented various changes to enhance the trademark filing system in India. An efficient registration strategy should help rights holders to reap the benefits of these updates. The Italian Patent and Trademark Office has made significant steps towards improvement over the past 10 years. However, foreign rights holders should be aware of the system’s various quirks.